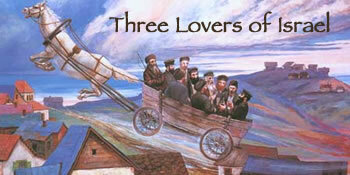 Three great Chassidic leaders were famous for their ahavat yisrael ("love of a fellow Jew"): Rabbi Zusha of Anipoli, Rabbi Levi Yitzchak of Berditchev, and Rabbi Israel Baal Shem Tov. What the ordinary observer would perceive as a glaring deficiency, or even an outright sin, would not "register" in his holy eyes and mind. Rabbi Zusha was simply incapable of seeing anything negative in a fellow Jew. But the Baal Shem Tov's love ran deeper yet. To him, ahavat yisrael was not the refusal to see the deficiencies of a fellow Jew, or even the endeavor to transform them into merits, but an unequivocal love regardless of their spiritual state. He loved the most iniquitous transgressor with the same boundless love with which he loved the greatest tzaddik; he loved them as G-d loves them-as a father loves his children, regardless of who and what they are.